She was, essentially, anti-hunting and anti-gun, even though her parents hunted. And then she met me—a wildlife management communications/education officer with part-time law enforcement duties and mandatory, annual firearms qualification; and a hunter. To be sure, our conversations were interesting and, at times, tense. I tried to understand her viewpoint. She was raised in a hunting family. She adored her dad, who was a hunter, but now she didn’t accept hunting. As sometimes happens, opposites attract and we dated over four years before marrying. After our first year of dating, I drew an antlerless mule deer tag for a unit between her home and mine. I invited her to join me in hunting camp and she accepted. We met at a small campground in central Utah. I had the camp set up: a small, cozy tent on top of a good tarp, with quality sleeping bags laid over sleeping pads. Keeping her comfort in mind, I even brought pillows. On the picnic table was a Coleman stove, lantern, a wash basin, the food box and other supplies. The fire pit was cleaned out with firewood stacked nearby. Did I mention the fall colors were spectacular? Mountain maples flaming red and the quakies shaking their bright gold and yellow leaves, their groves intermingled among the dark evergreens. It was a wonderful campsite, even before the addition of a local deer population that needed some does taken to balance the habitat’s carrying capacity. Our first night was peaceful. We ate outdoors as the campfire flickered with yellow, blue, red and orange dancing flames, warming us and creating a sense of wellbeing. It was the perfect time and place to hold hands and talk about life. In deference to her newness to hunting camp, we slept in the next morning. I rolled out as she slept snugly in her sleeping bag. When I opened the tent flaps I was greeted with a breathtaking view of our camp covered with a four-inch blanket of snow. Enjoying the spirit-warming experience of our snow-clad camp, I quietly put a coffee percolator and a pot of hot water on the stove and got the breakfast fixins ready to cook. I relit the fire. The smell of bacon finally rousted her but not until she enjoyed the hot water to wash up before leaving the tent. For years—over 40 to be exact—she has remembered and shared that morning experience with many people. She was deeply impressed with the beautiful, quiet, snowy campground, surrounding hills and mountains. Hot coffee at the ready, bacon and eggs cooking, a fire to warm up next to and, I think, a morning hug from someone who couldn’t be happier to share it all with her made a lifetime impression. Breakfast was another happy time for quiet talk. We spent the day scouting and walking a few trails to get the lay of the land, making plans for an afternoon hunt. We found a promising point that overlooked a mountainside with well-traveled trails on the hillside and through the cut between the hills. "The other side of hunting is hunters being a part of the natural world..."
We set up mid-afternoon below the ridgeline of the north-facing hill, looking down into the cut, with a view of the opposite hillside. My trusted BDL in .243, with its simple 4X scope, was in my lap and the binoculars were around my neck. We started glassing. I had her sit directly behind me. Several small groups of deer appeared that evening, but none offered a clear shot. Behind me, as the deer moved through the brush, I kept hearing her whisper, “Go deer. Go deer.” I laughed to myself, thinking she was rooting for the deer but keeping her cheers as soft as possible. I still laugh at that. That night over dinner we discussed deer management, the role that hunters play in balancing game populations and why permits were issued just for does when most hunters seemed to focus on taking a mature buck. As a conservation educator, I had the background to explain how deer management results in sustaining overall herds and maintaining healthy breeding populations to assure healthy herds in the future. She was willing to learn. After breakfast we searched out potential new locations to intercept deer then enjoyed a tasty, tailgate lunch next to a stream. She had to travel home that evening. Hunters share a universal connection with nature. They breathe in the special scent of fall, the dropping, decaying leaves that replenish the natural cycle of the forest. They soak in the music of the gurgling stream. They feel ancient connections with generations of hunters while gazing into the campfire. The soft crunch of new snow under their boots tells them nature is recycling life itself. And if they are fortunate to take home a deer, each subsequent meal will rekindle their experience, reminding them how hunting is a natural part of the life cycle—and how our lives are sustained by the sacrifice and conscientious, ethical use of other life. There was yet one more “other side” to this shared experience—not immediately after this trip but perhaps a year or more later—when this wonderful, thoughtful woman told me that she accepted guns and hunting as being a “natural and spiritually-compatible component of who you are.” I couldn’t have asked for a more perfect conclusion. Non-hunters seldom hear about, see, or experience this other side of hunting. Sadly, many hunters rarely take the time to share these natural, spiritual connections with others. But we must. Surveys and polls routinely show that some Americans feel hunters are predominantly focused on killing game rather than on hunter safety and ethics. They think hunters only want trophies and horns or antlers, but clear majorities of the public support hunting when hunters promote taking game to eat. Hunters know that renewing our bond with the natural world is part of being a hunter. This bond is the genesis for our shared conservation ethic. It is what keeps us donating and spending millions of dollars each year on wildlife conservation and habitat improvement. It spawns the purchases that preserve critical parcels of land that will support healthy, sustainable, future generations of wildlife as well as provide the necessary access for hunters to participate in their annual pursuits. The other side of hunting is hunters being a part of the natural world—sharing a kinship with the spirit of wild places and wild things, a stewardship of responsibility for the wise use of our wildlife resources—and contributing to a future that holds the same opportunities, blessings, rewards, experiences and connections for the next generation of hunter-conservationists. Chris Chaffin has been an outdoor communicator, educator and partnership manager for more than 40 years. He has worked on the national scene representing several prominent components of the outdoor community promoting hunting, fishing, the shooting sports and conservation. 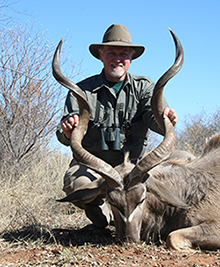 He served two terms as Treasurer for the Professional Outdoor Media Association (POMA), eventually taking on roles as vice-president, President and Chairman of the Board. In 2007, he launched Chaffin Communications, Inc., a communications consulting company focusing on the outdoors. In 2012, with support from the Outdoor Adventure Dream Giveaway, Chaffin founded and currently manages the Outdoor Adventure Conservation Fund, a Florida non-profit established to encourage and facilitate more people participating in traditional outdoor activities. For more information, click here.